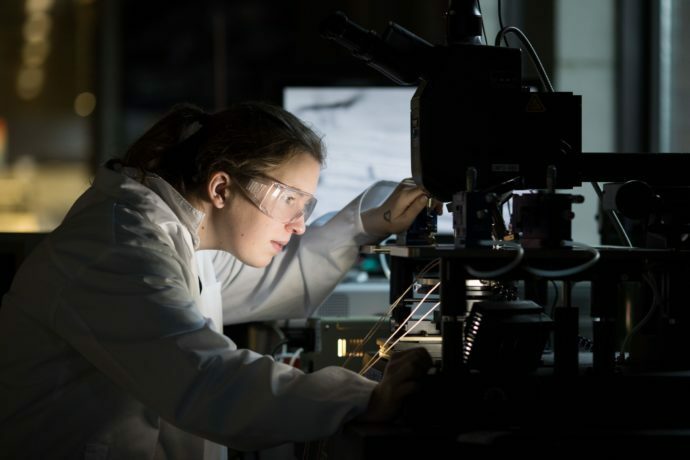 Sarah Guerin, lead author of paper published in Nature, performing characterisation[/caption]MOSAIC Group researchers have successfully modelled, grown and measured piezoelectric properties in the biomolecule glycine. Piezoelectricity is the generation of an electric charge in a material when stressed or deformed. Everyday examples of devices which utilize piezoelectric materials include mobile phone speakers, motion detectors in cars and video game controllers. However, many piezoelectric materials are normally synthetic and often contain toxic elements such as lead or lithium, making them unsuitable for biological applications. Glycine is a biomaterial and the simplest amino acid. Glycine can be used for a range of biotechnological applications. It occurs in practically all agro and forestry residues. Therefore, it can be produced at less than one per cent of the cost of currently used piezoelectric materials. MOSAIC researchers have determined that glycine can produce enough electricity to power electrical devices in an economically viable and environmentally stable way. The findings were published in a research paper on December 4th, 2017 in the leading international journal Nature Materials.